Grand homes built during the heyday of the Roaring 20s in Wellington Square will put out the welcome mat Sat., Dec. 1 and Sun., Dec. 2 for West Adams Heritage Association (WAHA) Holiday Historic Homes Tour & Progressive Dinner. 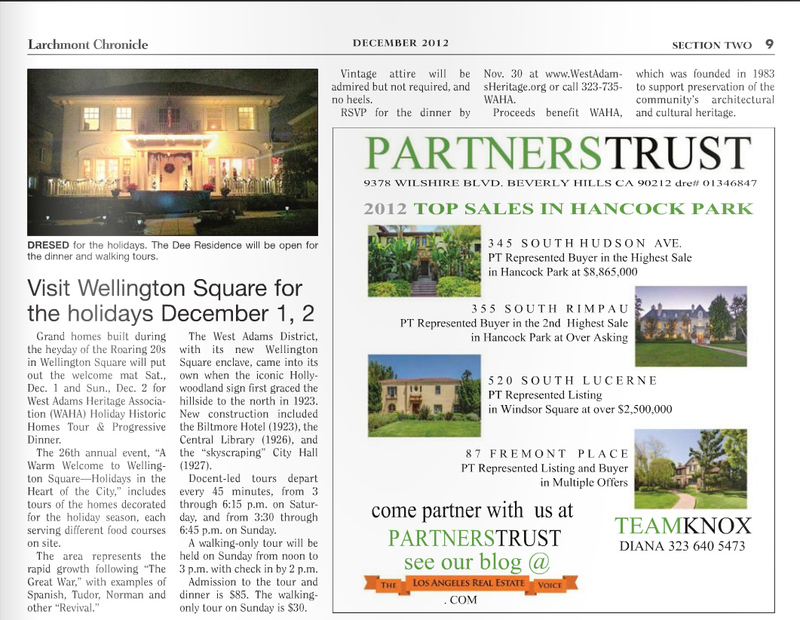 The 26th annual event, "A Warm Welcome to Wellington Square—Holidays in the Heart of the City," includes tours of the homes decorated for the holiday season, each serving different food courses on site. The area represents the rapid growth following "The Great War" with examples of Spanish, Tudor, Norman and other "Revival." The West Adams District, with its new Wellington Square enclave, came into its own when the iconic Hollywoodland sign first graced the hillside to the north in 1923. New construction included the Biltmore Hotel (1923), the Central Library (1926), and the "skyscraping" City Hall (1927).